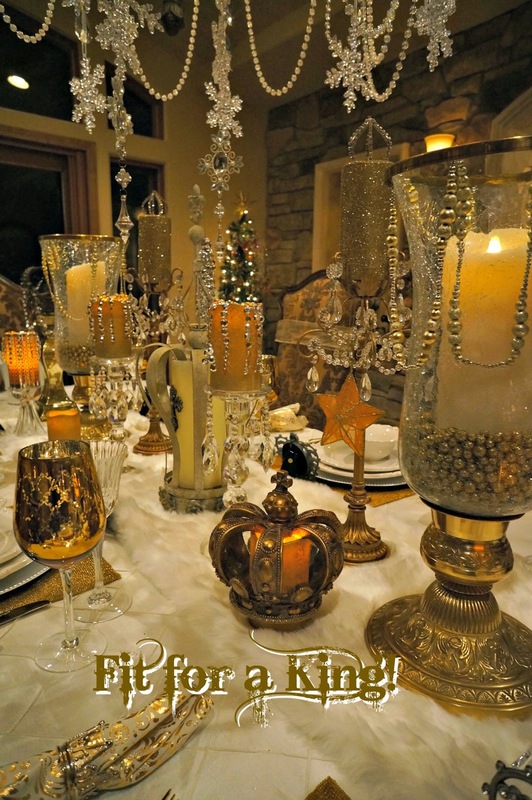 Home / Christmas / crown / tablescape / Winter / Table, Fit For A King! Table, Fit For A King! 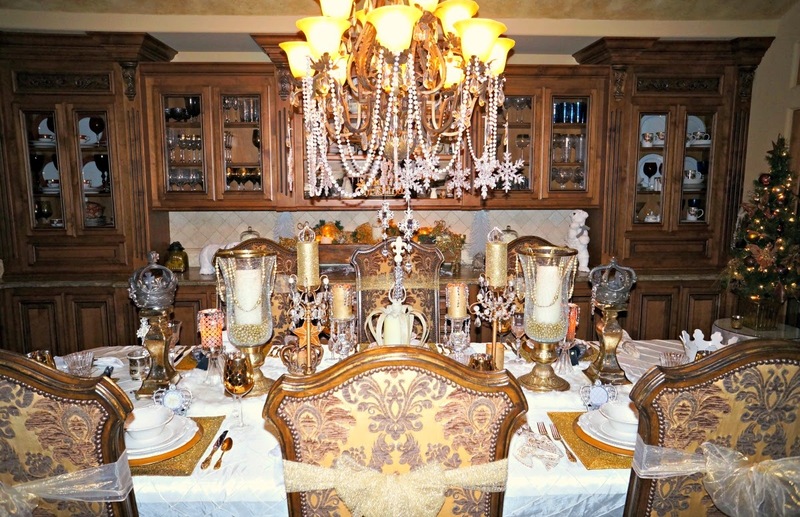 Our Christmas eve table setting, fit for a King. I am using gold and silver accessories. 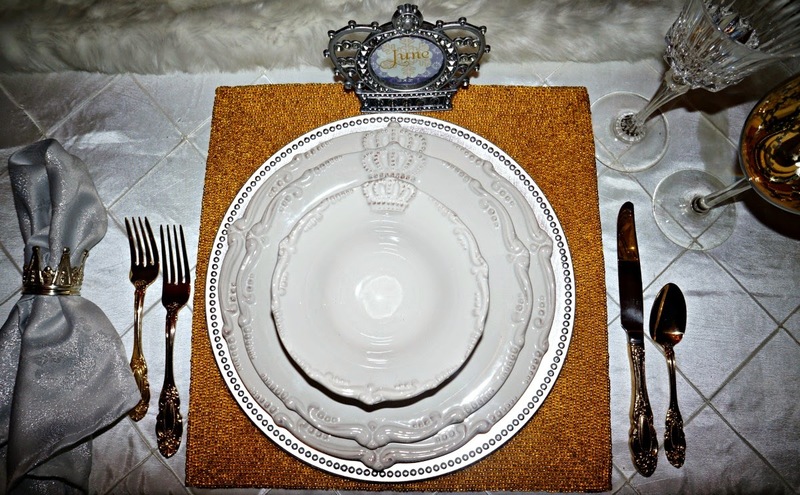 I alternated the gold and silver plate chargers with our Royal Crown dinnerware. A crown sits on top of every piece. Jacqueline has these very same plates. 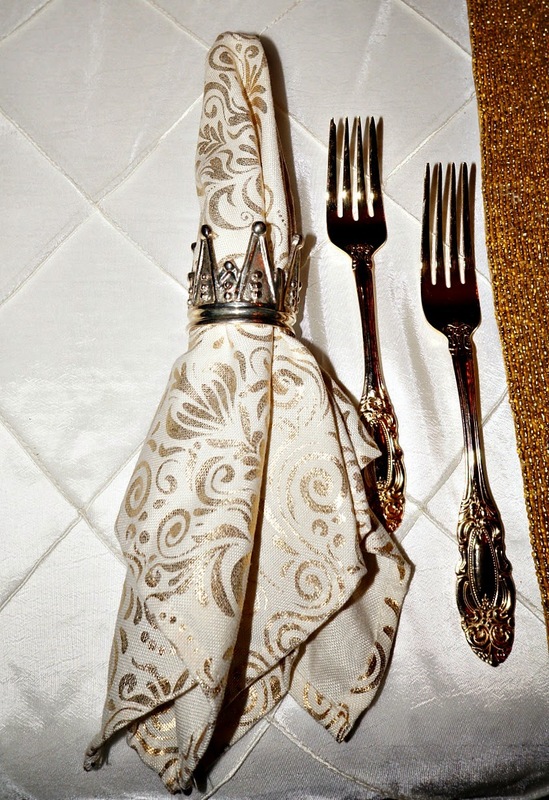 Gold and cream napkins with a crown napkin ring. Plenty of candles and glitzy decor. I am using four crown pieces I bought this year. I found the crown centerpiece with the Fleur de lis at Tuesday Mornings. I placed the gold crown over a battery golden candle. I tied bows with golden wraps around each chair. I am using our large gold hurricanes we bought years ago at California Backyard. I know Alycia and Jacqueline are also a big fan of chair covers. I added golden beads to both of the hurricane vases and placed a luminara candle inside. easier to turn them on and off. You can find these candles online at Amazon, Frontgate , Bed Bath & Beyond, QVC, and Kohls. They are pricier, but well worth it. Find them on sale, then they are reasonable. Geez, I am starting to sound like a commercial.... ha ha. I just happen to love them! Here's a demo. I am not receiving any compensation for this! A wide angle shot of our dining room. We are so thrilled with this addition we added about 4 years ago. Lots of dripping crystals, and beads were added to this table. 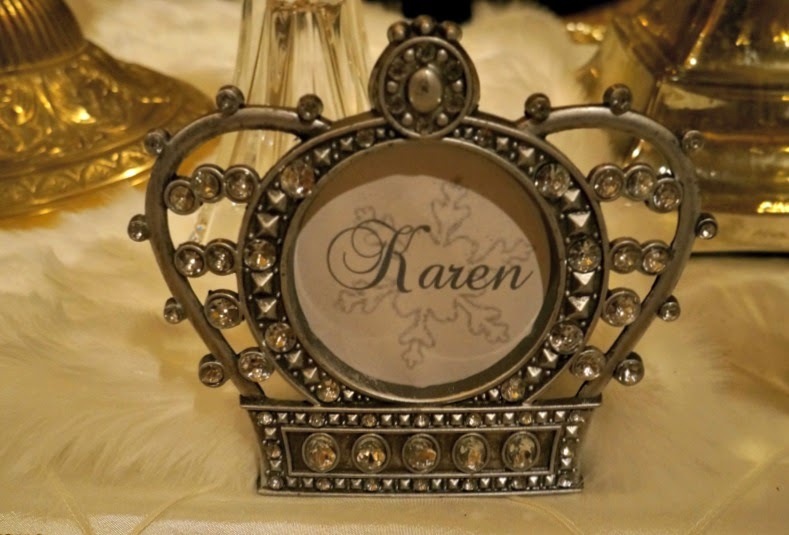 Each place setting has a silver crown photo frame. I hope you all had a very Merry Christmas. My wish is for each and everyone to have a peaceful, happy, prosperous and healthy New Year! Cheers! In case, you missed my last post on Baby Logan, you can view it here. So beautiful and elegant, Linda! Beautiful table setting and what a wonderful theme! 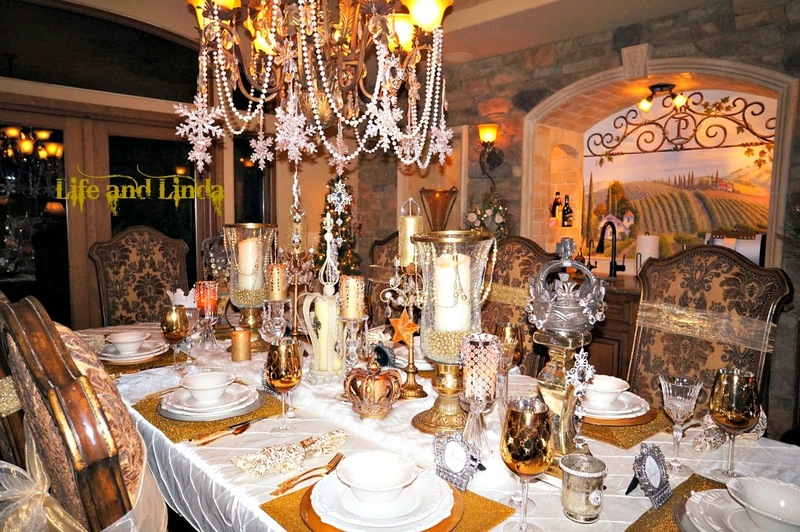 Linda, your table theme of royalty has always been my favorite. I have some special napkin rings that I've used and my guests always comment on how special they feel. 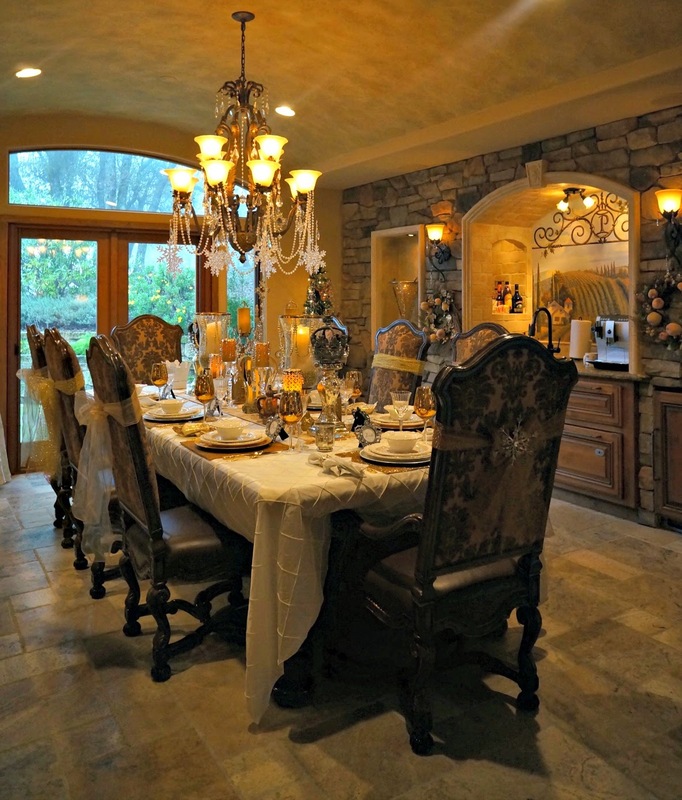 I can tell that you give top priority to making your guests feel right at home in your castle. WHAT FUN!!!!! So elegant Linda! I have a few pieces from Royal Crown .. love them. Also thinking about the gold flatware. It's so pretty! You've set a gorgeous table:) Have fun and all the best in 2015! Stunning! 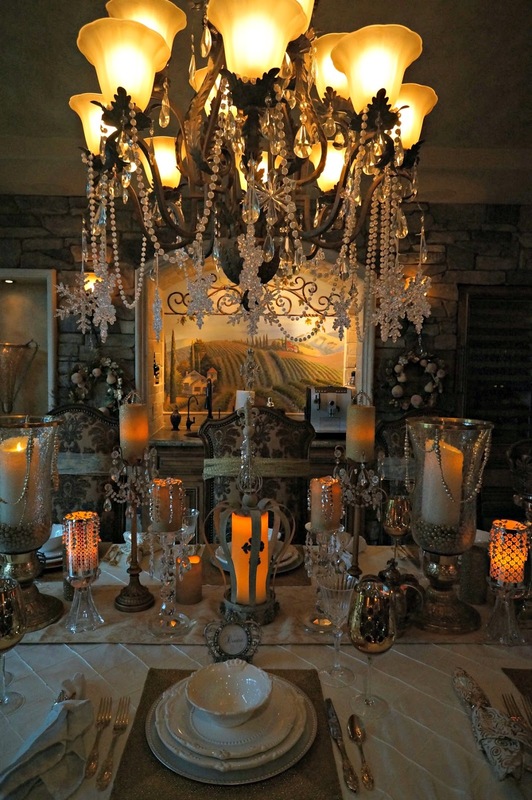 You are so creative with your tablescapes and always, always so elegant. Your guests are very fortunate! I'll have to remember this next year! 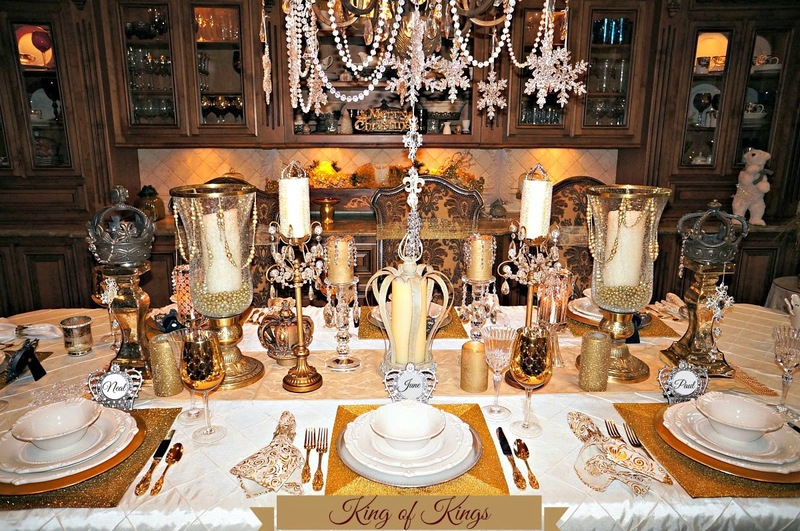 like it is for a King and your dining room set almost looks like a Kings banquet hall as well. Bet everyone enjoyed it immensely. Fit for a King, INDEED! Just beautiful!!!! Now I'm off to see Baby Logan! I love that name! 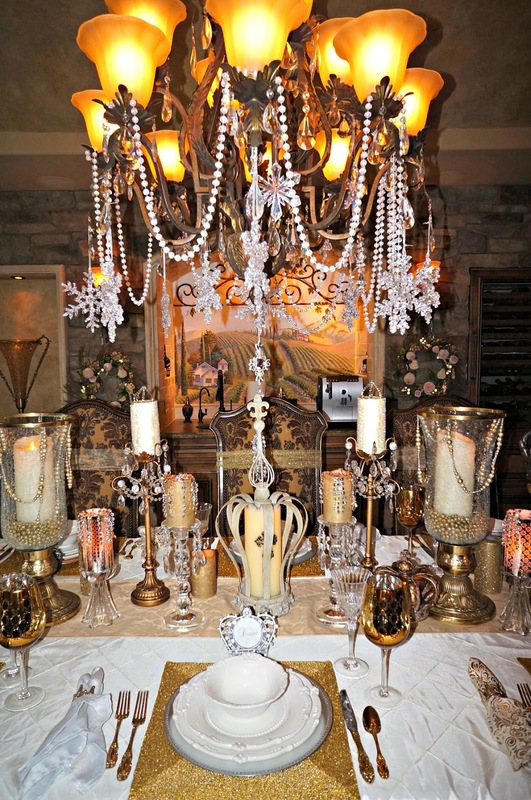 Wow Linda, your table looks so elegant and truly fit for a King (and Queen)! I love the crowns, the hurricanes and the chandelier. I'll need to look for a sale on the candles. I love the look! Happy New Year to you, sweet friend. Praying for a Happy & Healthy start to a wonderful New Year for you & yours. Best wishes to you for a great New Year! So much Magic created. Perfect. Absolutely magnificent Linda!! You sure know how to set an elegant table. I get so many good ideas from you. Thanks for sharing us such great posts this past year. What a truly beautiful table! I love all the crown touches! Congratulations on the birth of your newest grandchild Logan. Wishing you and yours a joyously happy and healthy New Year! Your tables are always so beautiful. I don't know how you manage to always top the previous tablescapes, and yet you do! It must take you forever to put everything together like that.